Baked. When slowly baked at a low temperature, fruit stays moist. Place chunked, halved or sliced fruit into a greased baking dish, and then sprinkle with cinnamon, nutmeg, and a crumb topping. Bake at 350 degrees F until tender, about 30 to 60 minutes depending on the firmness of the fruit. Frozen. Instead of grabbing a high fat ice cream treat, get creative this summer and make your own frozen fruit pops. They’re simple to make, and popsicle sticks and molds can be found at many stores. Grilled. When fruit is grilled over high heat the natural sugar it contains becomes caramelized. This concentrates the flavors and provides a truly delightful eating experience. Place grilled fruit atop a scoop of low fat ice cream for a delicious summertime dessert. 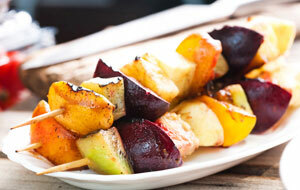 Fruits that are great for the grill include: mango, peach and pineapple.